Bicycling is an efficient, inexpensive, healthy and fun means of transportation. The City of Tacoma is working towards developing a connected network of bikeways and trails citywide so residents will be able to travel more comfortably by bicycle from most City destinations. Please see the Mobility Master Plan for detailed information on Tacoma’s bikeways network. The 2016 Tacoma-Pierce County bike map is now available. Look to your local bike shops for free paper copies. When cycling in Tacoma, if you encounter situations in the street or public right of way that the City should be notified about please call the phone numbers below. In case of emergency, contact 911. You may have noticed more bike racks popping up all over Tacoma. 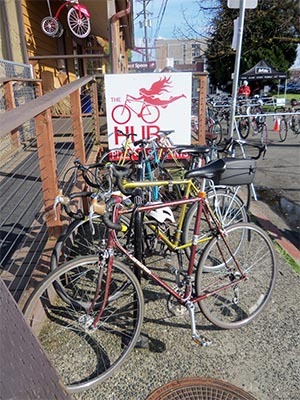 The City of Tacoma currently has a bike rack program and can provide free racks for its businesses or employers to meet the needs of cyclists. If you are interested in having a free bike rack installed at your business, contact Meredith Soniat, with the subject "Bike rack request" . Bike corrals may also be available depending on demand, business district interest and location. 2nd Cycle is a community cycle center which supports, educates, and advocates for cyclists, new and experienced, in the Hilltop and surrounding Tacoma community. 2nd Cycle provides community workspace, bicycle maintenance classes, literature, repair service, as well as new and used bicycle components while maintaining accessibility by providing affordable pricing. VeloFemmes is a group of women who recognize that cycling tends to be a male-dominated activity, and they are focused on getting more women on bikes. They hope to inspire more women (and more people in general) to get out and explore their communities by bike, and they hope to be a safe space where women can meet new friends and feel supported. Tacoma Wheelman's Bicycle Club is a 501c7 non-profit that aims to provide "Cycling for Fun, Fitness and Livable Communities." The Wheelman organize social and bicycle activities, work with other clubs and organizations to promote bicycling, and inform and educate members and the public regarding bicycle issues and safety. Kidical Mass Tacoma is a safe and fun series of bike ride for kids, kids at heart, and their families. Part of a larger Kidical Mass movement, the group organizes rides through various neighborhoods of Tacoma. Tacoma is home to an array of annual bicycling activities geared to the next generation of riders including Bikes for Kids, Kidical Mass (see video below), the Tacoma Bike Show, and the Dome to Defiance.